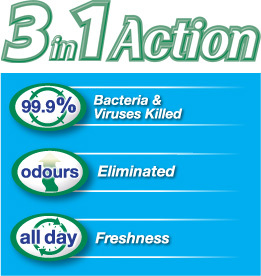 Zoflora have seen me a bottle of their Spring Time fragranced concentrated disinfectant 3 in 1 action. This comes in a small carton with a little bottle in, the thing is you make up the solution with water yourself at home, so this little bottle makes nearly 5 litres of cleaning fluid, its much easier to carry a small package home than a few litres of ready mixed cleaners. The instructions say you mix it at 1 to 40 ratio in water, so grab yourself a 1 litre spray bottle (my spray bottle below was one I had in the garage, and had only ever been used with plain tap water to water house plants). Add in 25 ml of Zoflora (approx a fifth of the bottle) then top it all the way up to 1 litre with water, if my maths is correct this is 1 part to 40. I figured I should give it a really dirty job to clean up after. A proper challenge! Here is my guinea pig, Dotty. He was very smelly and filthy as he is so elderly he soils himself in his sleep. Poor old boy. This meant the bathroom stank like wet dog and the dirt stuck in little rings around where the suction cups on our shower mat were stuck to the bath. 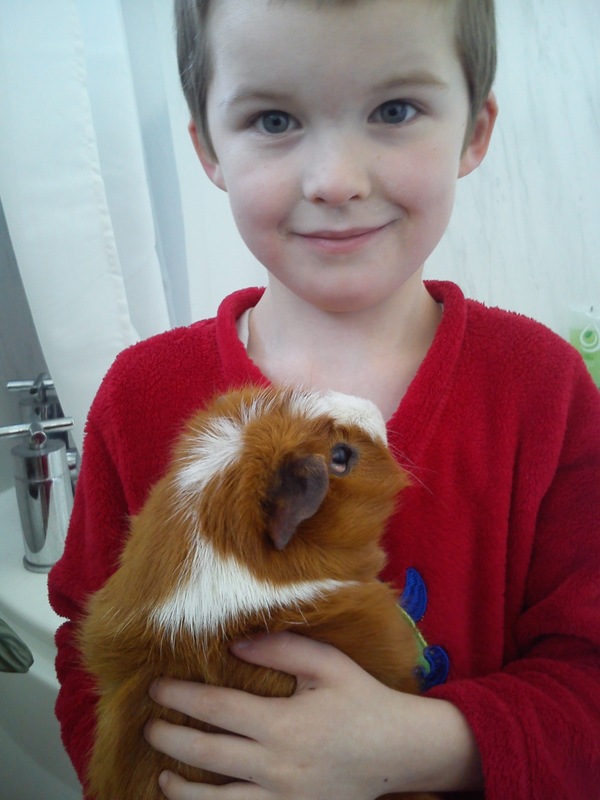 A pre bath huggle with Dotty guinea pig. He was pretty wiffy. 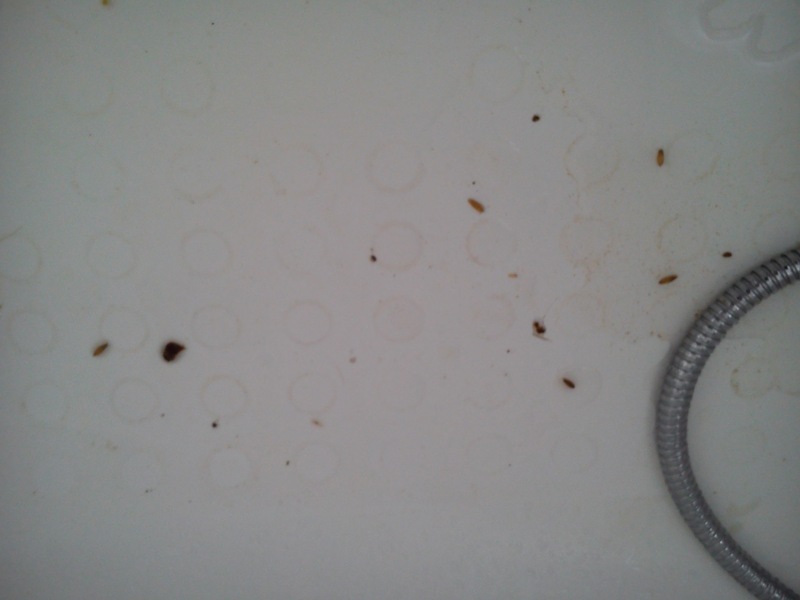 The mess that was left in my bath, look closely and you’ll see the suction cup marks from where my bath mat was. Gross! 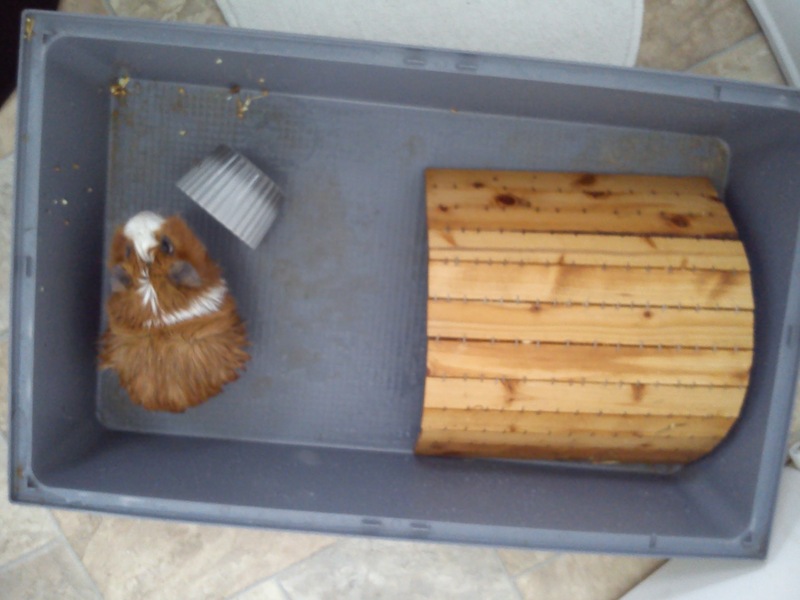 As you can see my bath and shower were clean afterwards, after washing Dotty and washing his hutch. The bathroom was also smelling OK afterwards, no wet dog type pongs. Since then I have been using the spray in the kitchen to clean work surfaces and I have been spraying it onto the floor to mop the lino flooring. It cleans well, smells better and disinfects too. I have also been spraying the diluted solution onto the carpet and wiping over in places the pets or kids have had accidents. In the bathroom it often generally smells near the loo, no obvious reason why as it is cleaned often, except I have boys and we know they have bad toileting habits! So I spray the loo seat and porcelain over in the morning after the lads are at school, loving that it smells better and it also is anti-bacterial which is reassuring. 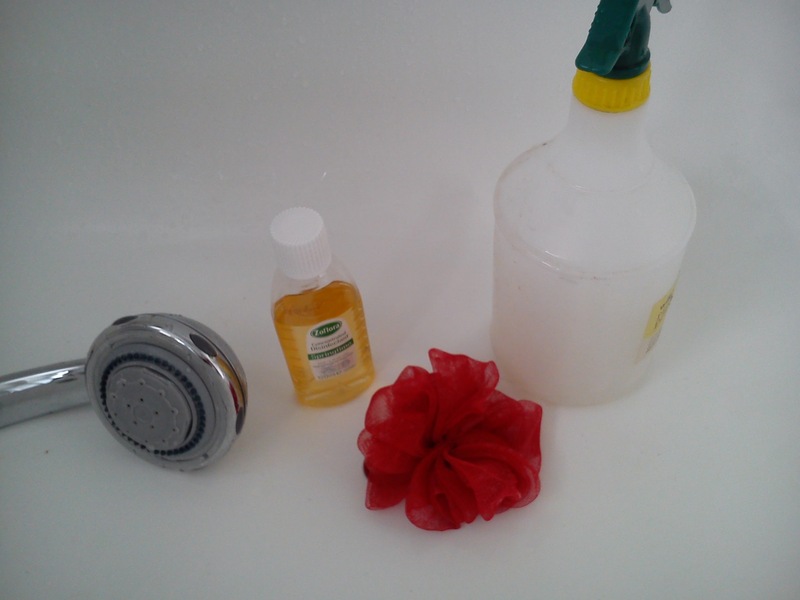 Worktops – A simple way to keep your kitchen worktops hygienically clean and eliminate odours – just add 2 caps of Zoflora to a clean and empty trigger spray bottle and top up with water for a handy ready to use disinfectant spray. 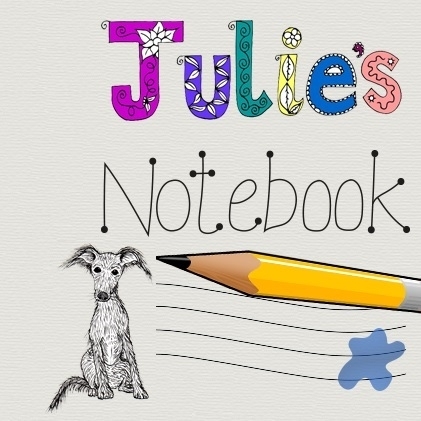 Drains and toilets – smelly toilets or drains? Pour a small amount of undiluted Zoflora down drains, ceramic or metal sinks or into toilet bowls to eliminate odours in your kitchen and bathroom. Zoflora can also be poured down outdoor drains to eliminate unwelcome odours. Potties – Zoflora’s Ready-to-Use Antibacterial spray is an ideal way to get rid of bacteria on children’s potties. Or simply dilute Zoflora disinfectant and wipe or spray surfaces. Bins – A quick squirt of Zoflora Ready-to-Use Antibacterial spray on bin lids kills 99.9% of bacteria and viruses and gets rid of bin smells. To eliminate bin smells from within the dustbin, use Zoflora Antibacterial Bin Fresh Gel. Sprayed into the bin or bin liner, this effective gel spray eliminates odours for up to 72 hours, even odours from soiled nappies. Hard surface pet areas – Diluted antibacterial disinfectant can be used on all hard pet surface areas to get rid of pet related smells and keep bacteria and viruses at bay. Just make sure you keep your pets off until the area is dry. Why not visit the Zoflora interactive room explorer for more ways to use Zoflora disinfectant. I was given a bottle of Zoflora free in return for my opinions in this post. That does not effect my opinions, all words are mine, except the quoted uses which is from Zoflora’s own site. Sponsored post. Careful though, undiluted zoflora is Flammable.